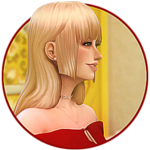 I'm a new CC creator and the main things I've done so far are just item recolors. 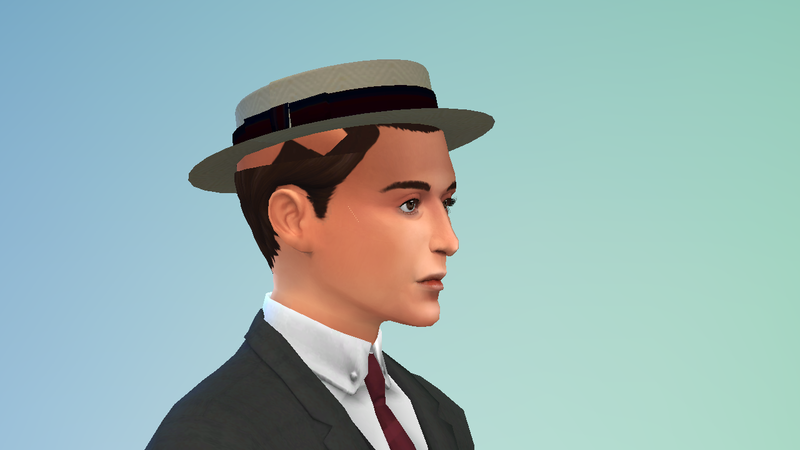 Yesterday however, I decided I was going to edit a boater hat to make Buster Keaton's famous little pork pie, for my Buster Keaton sim of course. Blender to me is fairly new, but before this project I played around with it and watched some tutorials so I sort of knew what I was doing. After a while of editing I finished and uploaded the .blender file to S4S and things worked out fine! I decided though, it wasn't good enough and edited it again and I think it's perfect! I import the file and behold- the hat didn't upload correctly .. The top of it is transparent and the rest of it is transparent and the rest of it seems like it too, but if you move around part of it is there. I tirelessly edited the hat in blender to try to see what I did wrong and I just don't know! Eventually I got impatient and decided to just put it in my game to see if it might work (it didn't). 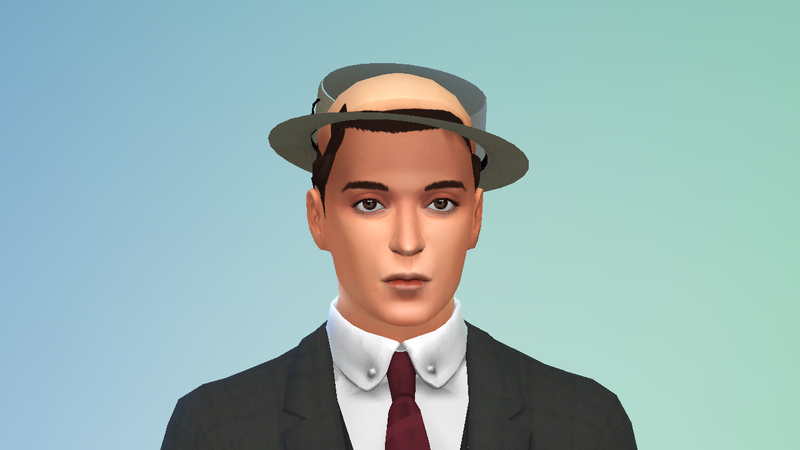 The hat was placed correctly but it still had that weird transparent issue, part of the sims hair was missing and the hat moved downwards each time the sims blinked. I'm so confused as to what I should do, I'm really stuck. Any help would be very much appreciated! Thank you! hi! the planes are looking inwards. I suggest flipping them. 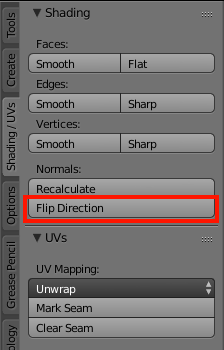 Go into edit mode, press A to select all and head over to the sidebar, uv tab and "flip normals". if that doesn't solve it please share the package and blend files. Thank you so much! That fixed the main problem with the appearance of the hat! 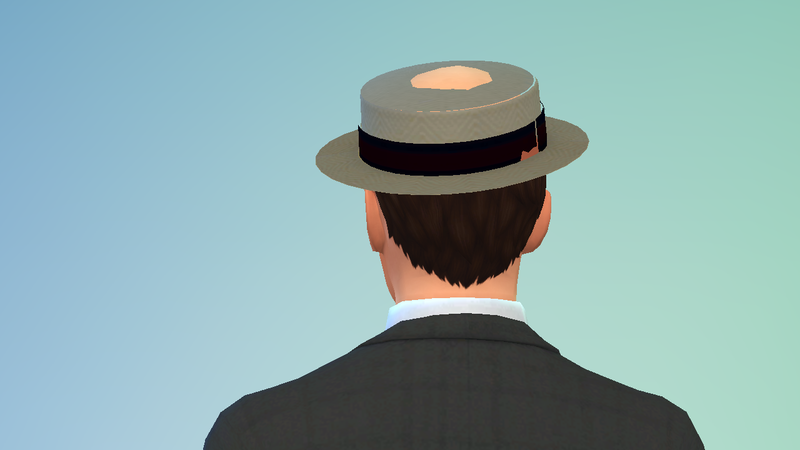 But when it's worn, part of the hair is still missing and the hat moves down when the sim blinks (if that makes any sense? haha sorry if it doesn't) And in the back, the sim's head pops through the hat, although it doesn't show that in S4S. What could this problem be? Thanks again! there's two types of hats. the difference is how tilted in the head. all hairs have 3 states, no hat/hat1/hat2. each of them represent a specific hat chop. the hair mesh is cut so it doesn't overlap with said hat version. having said that, your hat must match the tiny and position for either of this two or it will overlap with the hair or you'll see wholes. I suggest you export two base game hats that have these two different tilts, append them and use them as reference to know how to place your hat. as for the blinking, this is a weight issue. the bar must be assign to the wrong bone. please read this guide from step 12: sims4studio.com/thread/10/tutorial-using-sims-studio-accessory. Head is the bone you should apply. It's been a while since I first made this thread but I'm still having problems with the hair. I'm hesitant to change the placement of the hat as I want it to be as accurate to Buster Keaton as possible (he typically wore his hat tilted to the side). So I'm wondering how I can change the hat version somehow. I've seen other's hat CC that aren't in the two hair states for hats and so it doesn't affect the hair, how can I replicate this? Thanks for the help! I can't really tell which other hats you're mentioning without seeing them. the only suggestion I have is you clone another head accessory, like earrings, and not treat your item as a hat. meaning that once placed, the hair will not change. therefore, you'd have to measure the hat with the full hair mesh instead. make it a little bigger and move it up so that it doesn't overlap with the hair.